The Archaeological Site of Panamá Viejo and Historic District of Panamá represent the first European settlement on the Pacific coast of the Americas, and its continuation as an important colonial city on a different location. 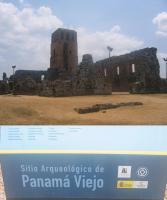 Panamá Viejo covers the remains of the first Spanish city founded by Pedro Arias de Avila on 15 August 1519. It was the starting point of the expeditions that conquered the Inca Empire in Peru (1532). It also was a stopover point of one of the most important trade routes in the history of the American continent leading to the famous fairs of Nombre de Dios (God's Name) and Portobelo where most of the gold and silver that Spain took from the Americas passed through. The Historic District of Panamá is where the residents resettled in the 17th century after an earthquake and a fire ravaged Panama Viejo. It is located on a peninsula and features many architectural styles, from Spanish colonial buildings to French and Antillean townhouses built during the construction of the Panama Canal. This Panamá City WHS covers two locations along the Pacific Coast: the site of the oldest European town on the American mainland and the first European settlement on the Pacific Coast of the Americas. It was inscribed in two stages, with reasons for inscription varying from inter-oceanic communications to Panamanian house-types, and from 16th/17th century town planning and architecture to Simon Bolivar's visionary attempt in 1826 to establish a multinational congress in the Americas. Whenever I see so many different arguments put forward, I always suspect real Outstanding Universal Value is lacking: such value surely would be much easier to pinpoint. On my way to Nicaragua I included a 3 day stop-over in Panamá, and used it to explore this hard-to-grasp WHS and its Atlantic Ocean counterpart Portobelo. Panama Viejo lies in a relatively quiet area north of the city center. The Metrobus dropped me at the entrance, where I was asked to pay the foreigners fee of 8 US dollar. This ticket includes both the museum and the archaeological site. The museum does only cover one floor, but presents the story of this site well. This was the first spot where the Spaniards settled on the Pacific Coast. It was clear from the start that the location wasn't great: a lack of drinking water and healthy environment sent them looking for an alternative from 1531 on. The remains of this old settlement are spread out on a narrow stretch of land along the Pacific coast. I enjoyed walking here, I was mostly on my own until I got to the central square where the cathedral is. The best preserved buildings are the remains of churches of various religious orders. I had to laugh about a sign at the Casa Alarcon: this was built by the clergy in 1590 (thanks to alms) as a house for rent and generate income. However, the clergy including the Bishops started using it themselves without paying anything. The other half of this WHS lies not far away, some of the metrobuses between Albrook Station and Panama Viejo even stop near Casco Viejo too. This historic district seems to be visited once every few years by visitors of this website, and the main question always is: how is the state of conservation at the moment? Getting there definitely has gotten safer over the years, and there now is a metro station from where you can walk into Casco Viejo. Also, according to an inventory dated April 2013, some 75% of the buildings are presently in a good state of conservation. This figure was only 5% at inscription in 1997. So they definitely have come a long way. The area now is tourist central: the historic buildings are home to lots of restaurants, cafés, boutiques, souvenir shops. Unfortunately there's quite a lot of traffic in the streets, mainly taxi's and minibuses dropping off tourists. I visited on a Sunday, and although the atmosphere certainly was lively most of the churches and museums were closed. So I just walked around a bit. I searched for the "Salon Bolivar", the enigmatic location that was highlighted in the site's first nomination as a WHS. Probably it was closed too. In all, I did not find Casco Viejo that special. A huge controversy has been going on about this WHS during the past WHC meetings. A maritime viaduct has been constructed around Casco Viejo, blocking its access to the sea. This could lead to delisting of the site in 2015, although it was never placed 'in danger'. This study by Lynn Meskell attributes this leniency to the dominance of the BRICS countries in the WHC during the last decennium. They like to see economic progress, and support Panama for its efforts. The maritime viaduct is finished now. There are 3 options left to prevent a crisis: the first is to limit the WHS to only Panama Viejo, the second option is to limit the size and focus of Casco Viejo, and the third is to fundamentally change it to a serial nomination including the Camino Real and Panama Canal (capitalizing on the "inter-oceanic communications"). As the deadline of Feb 1 2015 is near, I have been searching the web in Spanish to see where Panama is heading. Option 2 is the favourite, as it seems to be the most likely (and easiest!) route. A deletion of Casco Viejo as a whole is seen as it could have negative effects for the conservation of that area. Whatever the outcome, Panama Viejo at least is without controversy and deserves its spot on the List for its role in the European settlement of the Pacific Coast of the Americas. I'm living just across the street from Old Panama WHS, since I moved here 8 months ago I decided to take care of the area as a conscience citizen. Since the Patronato took care of the whole area, you can notice the work they have done, but also the work that must be done to make these WHS a more inclusive and better protected site at the same time. If you look closely, the Panamanians are not allow to enter the premises, leaving the green space between the entrance and the main structures (1000 * 50 mts), full of unused urban space for a ever growing population. In the other hand the lower part of the site is been affected by the rising sea level, increasing it vulnerability for climate change. A new road passing by the WHS, it had increased the traffic, as the vibration at the west entrance of the site, affecting notable to an old structure. Work need to be done, in order to mitigate climate change impacts, develop a green urban area for all the people to enjoy and reduce the vibration on some old structure must be part of the work to upgrade and protect this important WHS. The most important thing about this component of the site is probably the history it guards, as it sometime, before its destruction, was one of the richest cities in the world, by managing the gold and silver of Peru and Potosí. Its ruins (the old Cathedral stands out among them) are not impressive, but still communicate you a sense of days forgone. About the security...our cab driver warned us that this site had a very poor security record, and had some disbelief that we planned to visit the site, but my enthusiasm worked to convince everyone. Nothing happened, except seeing some homeless people, and I understand that the site was renewed and the conditions have improved since. Then we headed by cab to Panama Viejo and we had a short taste of some of its monuments (like the Cathedral, and the Golden Altar in San José church), and also saw the state of decrepitude of most of the old houses and buildings. Reading the review from Paul Tanner, it seems that things have not changed so much since, unluckily. We visited also the front of the sea, from where Punta Paitilla was a towering sight even then. It's not nice at all to see that the Panamanian government and UNESCO didn't got to an agreement concerning the Cinta Costera project, which on one side is a need (especially for the personal vehicle-depending panamanians), and on other site breaks the relationship that the city had with the ocean from where once, its richness came. The issue of development of modern cities vs protection of heritage and view axis, is like a neverending tale. I visited this WHS in January 2011. Panama Viejo is quite a let down, all that is left is a bunch of ruins. However, Casco Viejo, the historic district of Panama City is really worth a visit. The view from Cerro Ancon is breathtaking as is the view from a closed down dancing place in the historic district where you can enjoy an unobstructed view of the modern Panama City skyline. On our previous visit to Panama way back in 1991 neither the ruined Panama Viejo nor the Casco Viejo historic district of Panama City had yet been inscribed. Nevertheless we paid reasonable attention to the former because of its obvious historic interest but the latter seemed to pass us by without us having fully appreciated its possible merits! It had seemed just another colonial centre among many in Latin America and, after a quick perusal, we had moved on to the Canal and to Portobelo in our rentacar! So, in 2012, when we did a transit of the Canal by ship and then had a day at the Balboa end we determined to try to fill in on what we might have missed! Casco Viejo is set well apart from modern bustling Panama City on a small peninsula surrounded by some of the less salubrious parts of the city. I am not normally one to worry overmuch about “safety warnings” in cities (though I have, possibly as a result, have been mugged twice in my travelling career!) but the district of El Chorillo just to the west of the Casco has a particularly tough reputation as does that of nearby Santa Ana . The former was Noriega’s boyhood neighbourhood, the location of his HQ, the heartland of his populist support and the location of much of the bombing during the US invasion. Our taxi driver emphasized the “peligroso” of the area and had us lock our doors as we passed through! Over the years the entire area of the Casco and the surrounding neighbourhoods had degenerated into slums but Casco Viejo itself is now undergoing significant investment and gentrification. 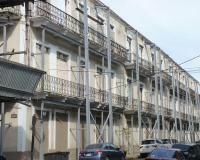 However, considerable tensions exist, with beautifully restored buildings standing next to shells whose front walls are held up by steel framework (photo). And always just a few blocks away lie real slums. The state of the site has figured in WHC discussions for the last 4 years with “In danger” status being threatened. The latest concern is related to a new highway which will pass right by (or, in one plan, even under) the peninsula and would totally alter Casco Viejo’s relationship to the coast (“Government plans to build a $776 million superhighway — phase III of the coastal beltway mega-project — call for a giant landfill stretching out into the ocean around Casco Viejo, eliminating the neighborhood’s historic maritime boundaries and burying part of its 338-year old seawall beneath a new roadside park.”). The issue is well mired in Panamanian politics with promises of jobs and housing improvements gaining the Government much support for the development plans despite opposition from the wealthier residents of the Casco and environmentalists. One of the aspects which sets Casco Viejo apart from other Spanish colonial cities is the French influence which arose during the failed de Lesseps attempt to build a canal. The Embassy to this day occupies a commanding position within the Casco at Plaza de Francia (which also has a monument to the 20000 or so French and French colonial workers who died in the attempt) and many of the houses exhibit the wrought iron balconies reminiscent of New Orleans. Even the un-renovated ones possess a certain charm! The Casco area only covers around 25 small blocks and, as well as many modest residential buildings, contains a cathedral, several churches (operating and ruined), some public buildings (such as the nicely renovated Salon Bolivar , the Presidential Palace and a theatre) and some pleasant plazas. The sea provides the boundary on 3 sides and an esplanade along the sea wall gives fine views across to modern Panama City’s surprisingly tall skyline as well as providing a pitch for numerous Kuna sales ladies from the San Blas islands selling their distinctive “Molas”. Among the churches, that of San Jose is noteworthy for its 16th century “Altar de Oro” supposedly saved from Henry Morgan’s predations on Panama La Vieja and moved to the new town a few years later. One of the ruins you will see is that of Noriaga’s favourite night club – still unreconstructed after its destruction in the 1989 US invasion! There is no doubt that, when it was inscribed in 1997 Casco Viejo didn’t meet the sort of preservation and management requirements which aspiring sites would be expected to demonstrate today. The nomination dossier states that “only 5% of the buildings in the Historic District are in a reasonable state of conservation, whilst 70% show marked physical or functional deterioration”. ICOMOS and the WHC seemed to accept that a Master plan developed in 1972 and turned into a “Revitalisation plan” in 1995 (but not “officially approved” at the time of inscription) showed adequate intention to do the necessary to preserve and improve the fabric of the site. And perhaps this was the correct decision – sometimes greater leverage can be applied for the improvement of a site if it is already under the UNESCO umbrella than if it is not. But, 15 years after inscription, the main impression we gained from walking around the Casco Viejo today (2012) was still one of significant decrepitude and decay despite examples of urban renewal particularly in the public buildings. However there did indeed seem to be a lot of work going on with a number of buildings shrouded in scaffolding. Panama hopes to be Latin America’s “Singapore” and its economic growth remains well above the Latin American average but there is a long way to go and Casco Viejo and its environs provide an interesting example of the difficulties of balancing economics, politics and the environment in a developing country with much poverty and weak institutions. It takes around two hours to reach Casco Viejo, the historical district of Panama, from Portobelo (another WHS). Quick glimpses of the famous Panama Canal can be seen on the way. In Casco Viejo, the cathedral and the ruins of numerous churches are worth a quick visit. Most of the interesting sites are located near each other so walking is the best option. The president of Panama also lives here so a heavy police presence can be sensed. After a brief visit, we headed towards Panama Viejo across town. This site was added to the WHS in 2003 as an extension. 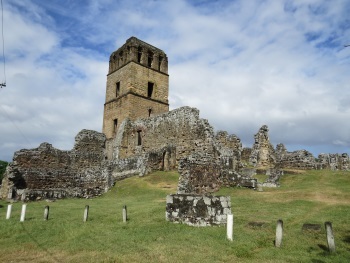 Although mostly ruined, I found this archaeological site to be the highlight of my visit to Panama. Unlike most colonial sites, I saw very little reconstruction in this one which gave it a sense of authenticity. I should mention, however, that Panama Viejo is not for everyone. My parents and brother were very unimpressed with the crumbling state of the buildings and decided to sit out after a cursory visit. Most tour groups I saw only visited the museum, which contains many impressive artifacts, and the cathedral site. I would recommend walking the trail from the museum to the cathedral site if time permits. Ruins of various churches line it. The climb to the top of the cathedral is also worthwhile and great views of the city skyline can be seen. Overall, I thoroughly enjoyed my visit to this WHS. Although overshadowed by the famous canal, I was very impressed with my visit. Unfortunately, I only had one day in Panama as I had to leave on my cruise that evening to head back to Florida. From "Historic District of Panamá, with the Salon Bolivar" to "Archaeological Site of Panamá Viejo and the Historic District of Panamá"
Panama Viejo is easy to reach by frequent Metrobus from Albrook station: the bus stops at both entrances to the site.With the new Metro, Casco Viejo can be reached safely by public transport too. Go to Cinco de Mayo station, and walk 10 minutes along the Waterfront or through the pedestrian street Avenida Central. Purpose Built Visitor Centre: Panama Viejo Visitor Centre. Architect - not known. See link. This states the inauguration date to be 2004, but a 2009 Mission recommended "Relocation of the projected visitor's facility at a considerable distance from the Main Square and the Cathedral Tower to preserve the visual integrity of the site and its setting;". The 2013 report states "The mission visited the new visitor facilities and museum located at the main entrance of Panama Viejo. Located in two buildings, new facilities include administrative area of the Patronato Panamá Viejo, laboratories and exhibition areas that facilitate interpretation of the site by visitors. The mission considers that the 2009 recommendation is fully implemented"
Camino Real: "Durante su historia desde el siglo XVI hasta el siglo XIX, el Camino Real fue, junto con el Camino de Cruces, una de las dos únicas rutas para cruzar el Istmo de Panamá. El camino, creado poco despues del descubrimiento del Mar del Sur, conectaba la ciudad de Panamá Viejo primero con Nombre de Dios y despues de 1597 con Portobelo"
Mercedarians: "Continuing two blocks west along Av Cincuentenario, you'll arrive at the ruins of the Iglesia y Convento de La Merced. Erected by the Mercedarian friars in the early 17th century, the buildings actually survived the fire that swept the city following Morgan's assault. However, the church's facade is missing because the friars dismantled it and moved it to Casco Viejo, where it can be seen today."